Watch video clips from an art show at Works Gallery in San Jose. “Calling Into the Void” includes works by six artists living in the U.S.
sacred spaces for new experiences.” Exhibit until Oct 29, 2005. The notes below are by the curator, Nazanin Shenasaa. Reza Aramesh&apos;s live performances juxtapose stereotypical elements to create visual and psychological tension. In “We Have Met The Enemy and He Is Us”, the performers are placed as objects of display on pedestals, performing the subservient task of serving wine. The use of Middle Eastern men encourages the viewer to question the position and expectations of Eastern immigrants in Western cultures, and highlights the ongoing fascination with the Other, both an object of admiration and subjugation. Taraneh Hemami&apos;s painting is a large scale interpretation of a”most wanted” list on the FBI web site. 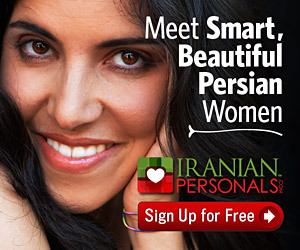 The low resolution thumbnails on the site provide little or no detail on the faces and identities of the people represented, bringing the viewer to a place where identities becomes stereotypes: images of women in chador and men with beards have become synonymous with terrorist characterizations. “Most wanted” is a contemplation on the construction of images of the enemy, the nature of representation and stereotypes of the Islamic community. In “Lost and Wondering” Nazanin Shenasaa references a poem by 13th century persian mystic Hafez, who refers to the suffering of the Gom-Gashteh (Farsi: Lost and wandering). Old Testament Joseph, whose separation is rewarded by reunion. The headless figure is displaced and likened to the emotional state of the immigrant, always searching for home, imprisoned in the timeless state of wandering.